Smartphones and tablets with the emerging Wi-Fi wireless networking technology, 802.11ac, will arrive early in the second half of this year, a Qualcomm executive said. Mobile devices based on Qualcomm’s Snapdragon 800 series processors will be the company’s first to get 802.11ac Wi-Fi, said Murthy Renduchintala, executive vice president of Qualcomm Technologies, ahead of the Mobile World Congress show in Barcelona. The new Wi-Fi standard in Snapdragon will increase peak data transfer rates, but at the same time enable tablets and smartphones to retain battery life similar to mobile devices with 802.11 b/g/n technology, Renduchintala said. The theoretical data transfer rates for 802.11ac is expected to be three to four times faster than that of 802.11n, which are in mobile devices, PCs and routers today. No new software drivers will need to be installed to support the new Wi-Fi technology in Snapdragon. It will work on all devices that have Snapdragon chips, including Android, Windows Phone, BlackBerry and Windows RT, Renduchintala said. Power consumption of a mobile device with 802.11ac will depend on the configuration. The wireless networking technology provides multiple lanes for faster throughput, but that can be adjusted to match the power and performance of a mobile device, Renduchintala said. The new 802.11ac technology will come with Qualcomm’s new RF360 communication chips that will be integrated into future Snapdragon 800 processors. The chip is expected to be demonstrated at the Mobile World Congress next week. The 802.11ac technology isn’t in HTC’s recently announced One smartphone, which has the Snapdragon 600 quad-core processor. 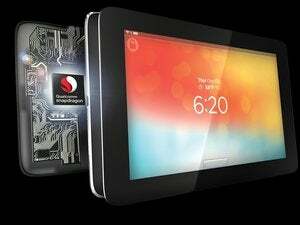 The Snapdragon 600 and 800 processors were part of a new generation of mobile processors announced by Qualcomm at CES. The Snapdragon 800 sits at the high-end of that lineup. Qualcomm’s competitor Broadcom has said it hopes to put 802.11ac wireless networking in mobile devices early this year. Other hardware such as routers have also been announced with 802.11ac technology. Beyond Wi-Fi, the RF360 communications chip also solve many problems related to LTE compatibility by supporting a full range of 40 LTE bands, Renduchintala said. That will help phones interoperate on multiple LTE networks in different countries. The chip will also support a full range of WCDMA and GSM bands. In some cases, some phones do not support 3G services on specific bands. It’s up to a wireless carrier or device maker to enable the full range of 3G and LTE bands, Renduchintala said. “We facilitate global roaming,” Renduchintala said, adding that users will be able to switch over between 3G and LTE services offered by carriers easily. The new communications chip is also more power-efficient, which can preserve battery life on mobile devices.